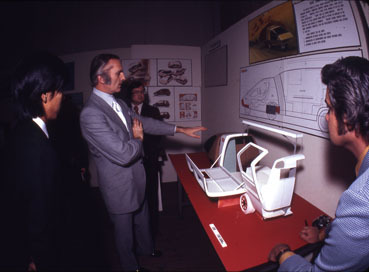 Senior design executives from General Motors Corporation challenged a class of advanced transportation students with the design of a total community transportation system projected for the year 1990. The students chose the master-planned 85,000 acre city and community of Irvine in Orange County, California. The problem involved the design of a balanced, integrated system of public, private, emergency, and service vehicles, to meet the needs of half a million people with a wide range of life styles and incomes. The system needed to be attractive, convenient, economical and efficient, and take into account all potential developments in technology, safety and ecological standards. Below are a few examples of the photo documentation from the project. GM Irvine Project, 1971. 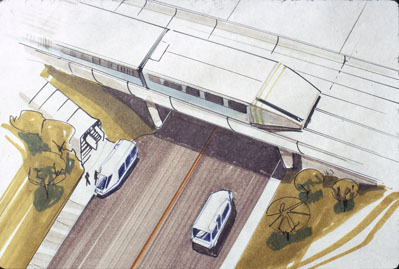 Student drawing of The Wedge on a ramp with the Irvibus below on a road dropping off passengers. Art Center College of Design. GM Irvine Project, 1971. 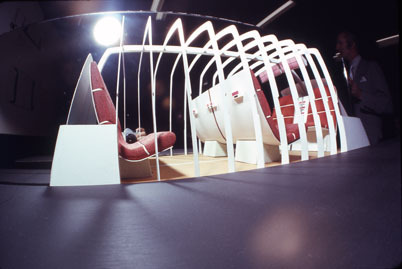 A model showing the interior of a computrak vehicle. Art Center College of Design. GM Irvine Project, 1971. 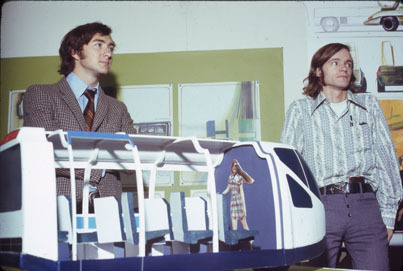 Finished model of the Irvibus with Joe Warren (PROD 1973) and Leif Chapman (TRAN 1972) standing next to it. Art Center College of Design. GM Irvine Project, 1971. Charles Jordan is discussing the Asobi project with Itaru Sugino and Hugh Jorgensen. Art Center College of Design.